As SXSW 2017 comes closer to its end, the city begins to look more and more wiped out. This year, the unofficial showcases really stepped up their game, giving the official lineups a run for their money. However, on Saturday there is a significant drop in the number of happenings all around. Early in the day, the streets are rather dismal and desolate. The shreds of Pandora linger outside the Gatsby. Tattered promo posters flood the streets, and an air of absence resonates as much of the buzz crowd has already left town. This is the right time for locals to take back their city and gain some semblance of reciprocity. One of the most highly anticipated events Rachel Ray’s tenth anniversary Feedback party at Stubb’s is the only place to start the day. She provides fans the well rounded experience as she intersects two of her favorite things – food and music – in one giant blowout day of festivities, thus making it a must-see event for many Austinites. It has become the staple landmark for SXSW’s final day. Throngs of hopefuls line around the block to try to get in to the space. As the sun uninhibitedly beats down on Stubb’s, Weezer wraps up the day. They repeat the prior night’s performance formula. Hit after hit keeps the crowd engaged in one mega singalong. The most exciting point is when they bring out a multi-string orchestra to play “Island In the Sun” along with them. Hearing “Buddy Holly” echo through the dusty venue creates an utterly nostalgic moment. Its origin The Blue Album celebrates its 23rd anniversary this year. With the mounting heat and exhaustion growing from sifting through crowds and standing in lines all week, there seems to be a tension in the air that took all week to manifest. Another factor adding to the problem is the fewer amount of showcases happening today which unfortunately forces more people toward the same places as they have less to choose from now. The Brooklyn Vegan party at Cheer Up Charlie’s has a line running all the way down the street. Fader Fort hits capacity and cuts off its line only a couple hours into the day. The most mystifying line experience is quite a trek away from the main drag at the Urban Outfitters party at Space 24 Twenty featuring the only live performance of The Internet at SXSW this year. One might think it is far enough away from the madness to be in the clear. Another beastly line still forms. Within an hour, people wrap around the block. By hour two, it goes down the street and around the corner. As security combs the seemingly endless spray of people to hand out wristbands for the event, those toward the end of the line lose faith and begin trickling into the parking structure across the street to view the show from a few floors up. The sun finally sets and 700 people flood into the venue. Last minute stragglers swarm the gate entrance to try to get in, creating a mob scene reminiscent of the rowdy throngs of people who caused a riot at the Death From Above 1979’s reunion at Beauty Bar during SXSW six years prior. Once the music starts, everyone is forced to enjoy it in whatever capacity possible. The most appealing quality about The Internet is how well their ’90s inspired R&B sound translates for so many different people. Ego Death, their third album which sprung them into stardom receiving rave reviews and airplay on major television shows including HBO’s Girls, takes priority in the set list. Singer and frontwoman Syd tha Kid eggs the audience inside on as well as the now hundreds of onlookers watching from the parking lot across the street to participate in a call-and-response singing of the hook, “You fucked up,” for “Just Sayin/I Tried.” Whether watching from top of a trash bin or from down the street, everyone engages. 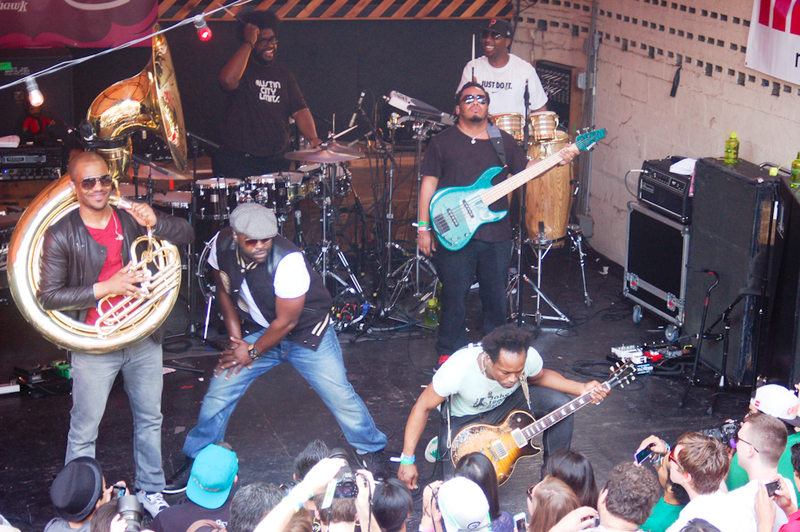 Back downtown, The Roots and Friends Bud Light official showcase incites similar chaos. The highly anticipated event stirs quite a bit of chatter all week due to its promise of artists Jidenna, Shakey Graves, Method Man, Redman and “special guests TBA.” It is often expected to be a star-studded lineup as The Roots dedicate an entire night to jamming with a well rounded mix of artists to close out SXSW. Early in the evening before the sun even sets, Twitter’s feed flows with posts about how the line of people is hours long, rivaling that of J Cole’s surprise SXSW Takeover showcase back in 2015. With a little patience and a smile, however, it is possible to get into The Roots’ jam. Surprise guests Frenship open up the night with a few songs to warm up the crowd. Famed rap duo Rae Sremmurd rolls in to play some of their viral hits including a “No Type” and “No Flex” medley and “Black Beatles.” Sweet Aussie singer soloist Cloves sings a couple more with The Roots backing her. The next real crowd pleaser is Jidenna, popularized by his mega hit “Classic Man” which was dubbed the song of the summer for 2015. In between artist changes, The Roots jam out with some of their own music to keep the night moving. As a nod to the recent loss of Chuck Berry, they play a true-to-form cover of “Johnny B. Goode.” The sweet gesture brings a tear to the eye. Folksy rocker Shakey Graves maintains that lively momentum. This jam session takes an abrupt turn back into the hip-hop and R&B style and parks there for the night as De La Soul even joins for one number. T.I. commands the stage for “About the Money,” then asks everyone to remember where they were when this next song “Bring ‘Em Out” came out. Moving back in time from hits of the 2000s to straight up ’90s gold, Brandy returns to the stage after years of absence and reminds everyone that she is officially back on the music map. Some of her more mainstream radio songs like “Baby” and “Boy Is Mine” give the fans everything they need to wave and sing along with her. Cell phones fly up when Method Man and Redman pull up to cap off a rather exciting night. What a special time to be alive. From somber solo singer-songwriters to rock gods and jam bands, SXSW provided a well-rounded selection of talented artists. Though this year may have been more lightly attended than others in the past, it still kept the bar high with a jaw-dropping caliber of artists to offer. Showcases–official and unofficial–really stepped up their game, picking up the slack where the others like Spotify House and Hype Hotel dipped out. It is going to take a whole year to be ready to do it again, but if this year’s effort is any indication for the future, we look forward to what SXSW holds for 2018.